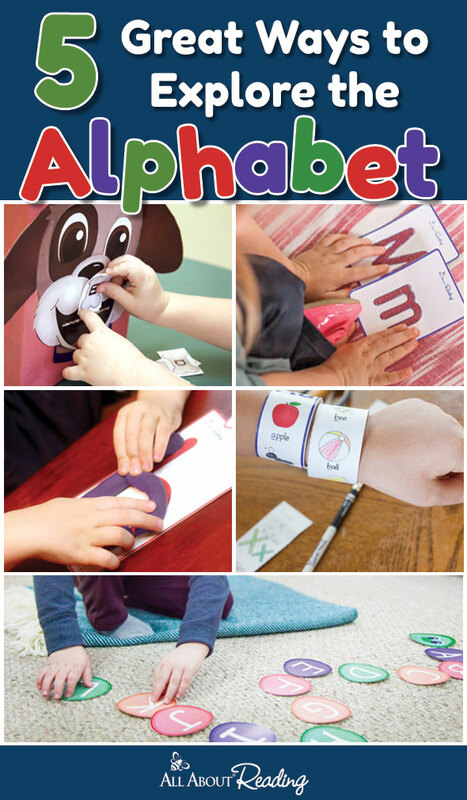 If you’re ready to explore the alphabet with your preschooler, here’s a great place to start! Letter knowledge—learning and understanding the alphabet—is one of the Big Five Skills that lay a strong foundation for learning to read. Letter knowledge begins with letter recognition. One of the most effective ways to give kids a jump-start on this important pre-reading skill is through play. 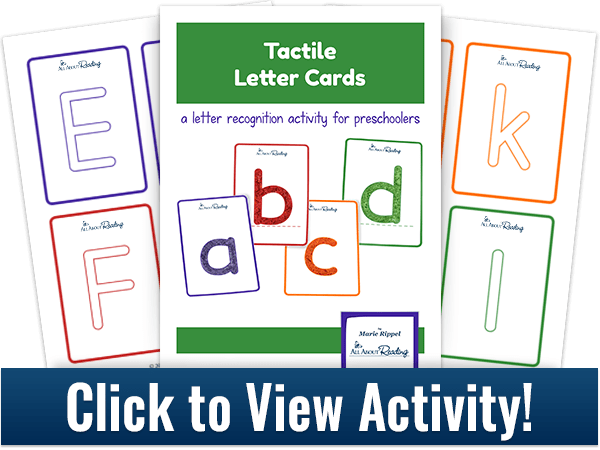 The five letter recognition activities below provide plenty of hands-on fun and are designed to let kids play with the alphabet in an engaging, low-pressure environment. Click the links below to view more photos and to download templates, instructions, and a variety of ideas for using each activity to explore the alphabet! 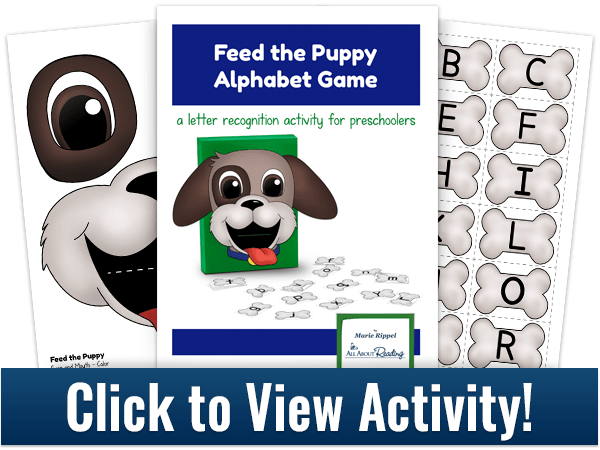 “Feed the Puppy” Alphabet Game – The “Feed the Puppy” Alphabet Game lets children practice the names of the letters in a super-fun way. After all, who doesn’t love learning with a cute puppy? Tactile Letter Cards – Children learn about the world around them through their senses. Our tactile letter cards let children use their sense of touch to learn about uppercase and lowercase letters. 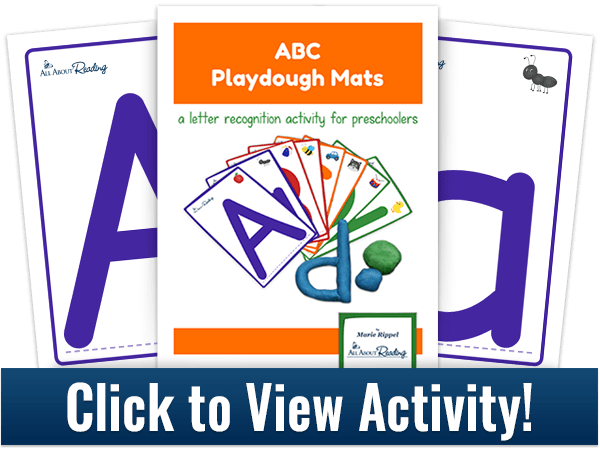 ABC Playdough Mats – Crafting letters out of playdough allows children to feel the alphabet as they roll and bend the dough to form uppercase and lowercase letters. Your child may not even realize he’s learning! 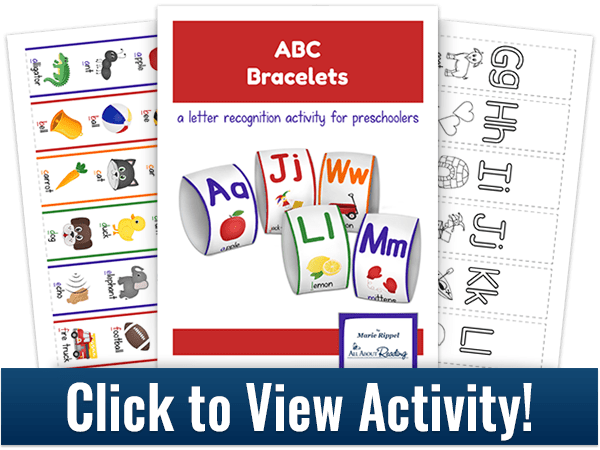 ABC Bracelets – “Letter of the day” activities are a great way to introduce a little bit of alphabet exploration into your everyday life. ABC bracelets are the perfect addition to your “letter of the day” line-up! 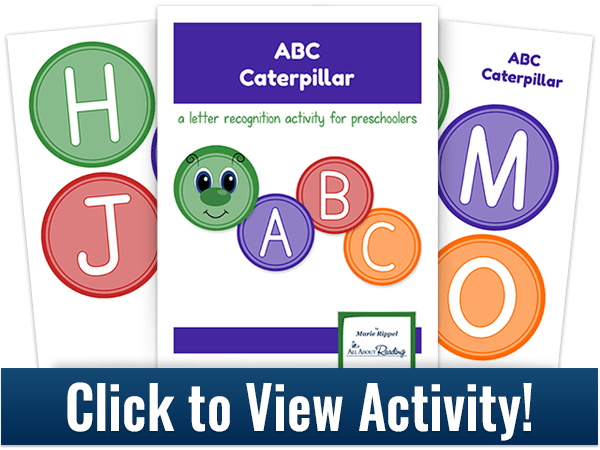 ABC Caterpillar – As your child inches his way through the alphabet with this colorful caterpillar, he’ll get plenty of hands-on alphabet play. With this activity, you can move your child from learning the letters all the way to putting the letters in alphabetical order. Remember…don’t forget to take your child through the whole alphabet. This may seem obvious, but sometimes young children fail to master the last several letters. Be sure that your child knows U, V, and W as well as he knows A, B, and C! 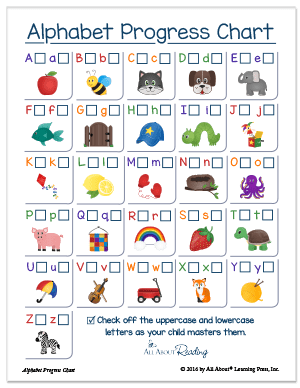 To help you keep track of which letters have been learned, you can download this great little alphabet progress chart. Post it on your fridge or playroom wall. If you’re ready to tackle the rest of the Big Five Skills, be sure to check out the All About Reading Pre-reading program. Your student will enjoy special games, crafts, and story time read-alouds, and you will love the way your student effortlessly learns essential pre-reading skills. Marie Rippel is the author of the award-winning All About Spelling and All About Reading programs. She homeschooled her own children through high school and now lives her passion for teaching children how to read and spell. Connect with Marie Rippel on Facebook and sign up for her newsletter to receive more great resources like this one!